Grindelwald is described as being extraordinarily convincing, to the point that they had to prevent him from speaking while he was in prison so that he wouldn't exercise his influence on the guards. He convinces Queenie, who had previously shown no inclination towards dark magic, to join him in less than a minute. After he gives a brief speech, she voices no objection to joining him (in spite of realizing who he is) and seems unswayed by Jacob Kowalski’s objections. Indeed, she seems virtually bewitched. On the other hand, Jacob seems largely immune to his influence at the rally (apart from being visibly distressed by Grindelwand's prediction about another war). He also seems to know exactly what to tell Queenie to be as convincing as possible, even though he's apparently not gifted at Legilimency (or, at least, he's later seen consulting Queenie's skills on the matter). 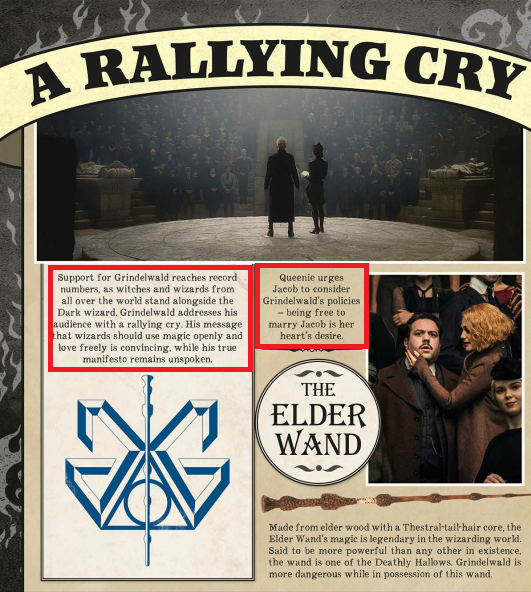 Is Grindelwand using the Imperius Curse or some other method of bewitching people to enhance his influence over them? Or do people really find him that persuasive? And how did he know what to tell Queenie? It’s implied in interviews it’s mainly skill. Though it’s unclear in the movie itself whether Grindelwald’s ability to convince people to join him is magical or just his own skill, it’s implied in the interviews where those involved in making the movie discuss it that it’s his own ability to persuade people. The reason Queenie joined him was because he convinced her he’d be making a world where she’d be free to marry Jacob, and made her believe in his cause that way. I think the fact that even Queenie could go over is really significant. For me, Grindelwald is a much scarier villain than Voldemort. Because Voldemort was pure evil. People followed Voldemort as much because of his power and brute force [as] his power of persuasion. The thing about Grindelwald is, he makes sense. He speaks to the needs that people have. He understands his audience and he gives them what they want to serve his own needs. So I understand Queenie, who wants to be with Jacob but where the magical laws deny her that possibility. You can see why someone who tells her in his world, in the world that he will rule, that she will be able to have what she wants, you understand why she goes over. To me, Grindelwald is relevant. He speaks to today. But he’s also, because history repeats itself, a timeless villain. I think he’s incredibly scary. David Heyman says that Grindelwald convinces people by telling them what they want to hear, which implies that it’s at least somewhat his own skill. It’s also still possible that it’s at least somewhat supplemented by some type of magic, but it seems that his persuasiveness is meant to be an integral part of his character and what they’re trying to show about how even “good” people can be convinced to join a “bad” cause if given convincing reasons. The message described by David Heyman wouldn’t be as clear if Grindelwald effectively just Imperiused everyone. Furthermore, as Valorum says in the comments, Grindelwald’s message is actually convincing. His message is that wizards should use magic openly and love freely. That message is convincing to them. Why did this character join Grindelwald? Why didn't Grindelwald kill Spielman? Is what Grindelwald tells Credence true?